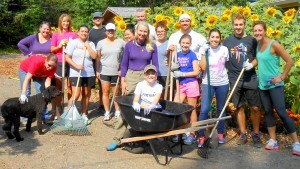 Become A Garden Volunteer ! Join us in garden and help our students build raised beds, compost bins and a chicken coop! Lend a hand planting organic vegetables at Focus on Youth headquarters that our students have duped Sunflower Farm. You can find us near Multnomah Village at 6001 SW Garden Home Road Portland Oregon 97219. Throughout the year we take homeless youth on photography field trips to experience the beauty of nature through the lens of a camera. These photo shoots are educational and inspiring for teens who have never experienced many of the beautiful places in Portland. 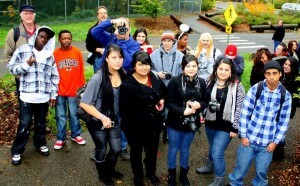 The field trips include such places as The Forestry Center, The Audubon, Leach Botanical Gardens, the Rose Garden, Hoyt Arboretum, The Japanese Garden and Lan Su just to mention a few. Our volunteer mentors encourage homeless youth to help them achieve academic and artistic success, and we provide these young people with the skills they need to establish goals and acquire confidence. We welcome anyone who has a desire to make a difference in our community by mentoring. In addition to field trips we welcome volunteers to help us install student photography exhibits around the city. 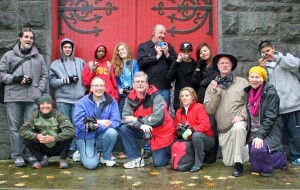 Focus on Youth partners with Photographers from American Media Photographers of Oregon and The Portland Metropolitan Photographers Association as well as amateur photographers . If so, please contact Executive Director Donna Lee Holmes at 503 341-6878 for a job description. We are currently interviewing candidates for a position on our board. Diversity is the cornerstone of Focus on Youth and we are committed to creating an inclusive environment where all individuals are valued and respected. Our organization seeks to serve a racially diverse spectrum of low-income families, and we strive for a board composition that is racially and ethnically diverse.Focus on Youth maintains a policy of recruiting students, volunteers and electing individuals to the Board of Directors on a basis of their merit without regard to race, color, creed, religion, age, gender, sexual orientation, military status, marital status, political opinion, national origin, familial status, mental and physical disability, gender identity, and source of income or disability status. It is assured that this commitment to equal treatment applies to all aspects of our organization. Volunteering is a great way to meet other caring and passionate people who are making a difference in our community. We love our volunteers and we invite you to join our dedicated team in creating a brighter future for our community.